Utrecht, The Netherlands - Eurail Group�s fiscal year has gotten off to a good start as the eco-friendly company announces that sales have risen by 9% in the first six months of 2010; these results are compared to the same period last year. Although they recognize that the North American audience is slightly lagging behind with a decrease of -4.8%, Eurail Group suspects that this shows a sign of recovery by acknowledging that the decline for this market was far more dramatic in 2009. �The Eurail Group is optimistic that we are on track to reach our target of 450.000 passengers before the end of the year�, concludes Ana Dias e Seixas. At the 2010 Paris Motor Show, Hyundai is revealing the latest additions to its growing collection of eco-focused vehicles. The ix20 Blue and ix35 hybrid concept, both making their world premieres at the show, join the four vehicles (i10 Blue; i20 Blue; i30 Blue concept, and ix35 Blue) that are already part of the company�s cutting-edge Blue DriveTM programme. This initiative is driving the company towards its target of global automotive leadership in environmentally-conscious technologies. The eco-friendly variants in the Blue DriveTM vehicle line-up incorporate a number of real-world modifications to further enhance the standard cars� already-impressive environmental credentials. The improvements are achieved without compromising performance, reliability or driver satisfaction, making all Blue DriveTM models a realistic solution for contemporary motorists. All of these models employ the latest energy-efficient power train technology developed at the Hyundai R&D Centres in Korea and Europe. The new, downsized 1.0-litre Kappa petrol and 1.7-litre U2 diesel engines, for example, are endowed with a number of environmental improvements: high-performance, low-friction engine oil � to considerably reduce driveline friction, dual continuously variable valve timing, improved combustion efficiency, gear ratio optimisation, and engine control optimisation � to increase engine efficiency. A noticeable change from the driver�s perspective is the application of Hyundai�s Idle Stop & Go (ISG) system. This innovation cuts the engine when the car is stationary and the gearbox is disengaged, and instantly restarts the engine when the clutch pedal is depressed. This is particularly effective at minimising emissions and fuel consumption in start-stop urban traffic. With its ISG system, Hyundai adds an alternator management system to maximise energy regeneration during braking and to provide good acceleration performance by minimising the alternator workload. To improve these new Blue DriveTM vehicles� aerodynamics and lower their rolling resistance, a variety of measures have been implemented. Underbody panels have been installed on i30 Blue to cover the drag-inducing cavities that exist on regular vehicles and negatively affect fuel efficiency. Certain models also feature reductions in brake-pad drag on the discs � and wheels fitted with low rolling resistance tyres, inflated to a higher pressure. Externally, the vehicles closely resemble their �standard� equivalent models, but can be easily identified by bespoke badging and paint colour. A logo on the rear indicates that the car belongs to the Blue DriveTM family, and all models are finished in the same unique shade of Lavender Blue with the same attractive graphics on the bodywork. The i10 Blue, which goes on sale at the end of 2010, employs the new and extremely efficient 1.0-litre Kappa petrol engine, which produces 69ps at a lower rpm level of 6.200 rpm while generating 94.1Nm (9.6 kg.m) of torque, and is fitted with a dual continuous variable valve timing (CVVT) system. By tweaking the car�s aerodynamics and making refinements to the power train, CO2 emissions in the i10 Blue have been reduced to just 99g/km. The i20 Blue features the exciting U2 1.4-litre diesel engine, designed and engineered at the R&D centre in R�sselsheim, Germany, and produces 75ps at a lower rpm level of 4,000, while generating 221Nm (22.5 kg.m) of torque. This engine is mated to the latest six-speed manual transmission. 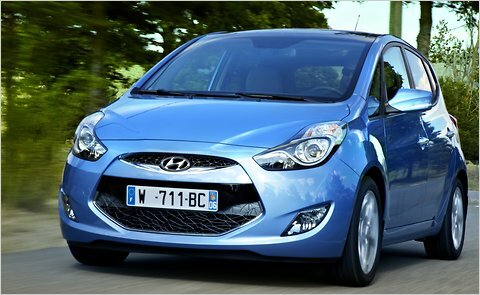 Producing just 98g/km of CO2 emissions, the i20 Blue is scheduled to go into production in 2011. The all-new ix20 Blue, scheduled to go on sale at the same time as the standard model later this year, also features the U2 1.4-litre diesel engine mated to the six-speed manual transmission. Its CO2 emissions figure of 114g/km is one of the lowest in the MPV segment. The i30 Blue concept utilises the U2 1.4-litre engine, which produces 90ps at a lower rpm level of 4,000, while generating 240Nm (24.5kg.m) of torque and featuring a six-speed manual transmission with optimized gear ratio, the latest generation of Hyundai�s fuel-saving transmissions. Furthermore, improved engine performance equivalent to conventional 1.6 diesel engines is acquired through changes to engine mapping of the ECU (engine control unit) and inclusion of a variable water pump, overrun alternator decoupler, as well as a high-efficient alternator. Just 94g/km of CO2 emissions will position the car as an extremely attractive package for customers. The ix35 Blue, which goes into production at the end of 2010, is available with an extremely impressive CO2 emissions figure of just 135g/km, positioning it not only as a rival to leading C-segment SUV models but also to many C-segment hatchbacks. The U2 1.7-litre diesel engine, also designed and engineered at the R�sselsheim R&D centre, produces 115ps at a lower rpm level of 4,000rpm, while generating 260Nm (26.5 kg.m) of torque. This engine is also mated to the latest six-speed manual transmission. Powered by the U2 1.7-litre diesel engine with maximum power rated at 115 ps and a 5kW electric motor, the ix35 hybrid concept boasts an outstanding CO2 emissions figure of just 117g/km. Featuring the company�s six-speed manual transmission, the mild hybrid system is complemented by a number of Blue DriveTM developments, such as; the adoption of high efficiency variable geometry turbocharger (VGT); a reduction in engine friction; a full under cover to improve aerodynamics; application of the Idle Stop & Go (ISG) system; and use of low-rolling resistance tyres.